Baby Boards! 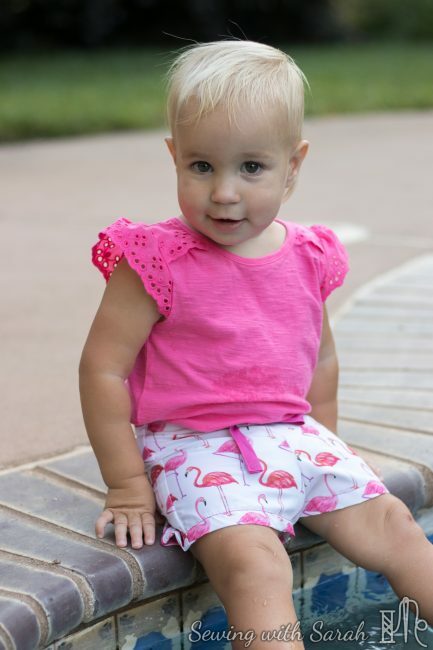 Sewing with Boardshort Fabric! 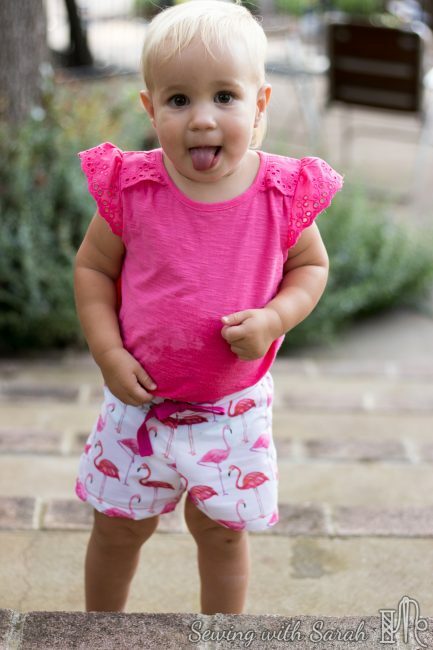 If there’s anything cuter than flamingos, its a baby in flamingo pants. I mean, really. How can you NOT smile when you see these? It all started with some board short fabric from Vintage Lace. I’d never ordered custom board short fabric before, but since the retail options are SO limited, I got curious. I managed to resist the pre-order, but when retail came around for this flamingo print, I was all out of excuses. I HAD to buy it. 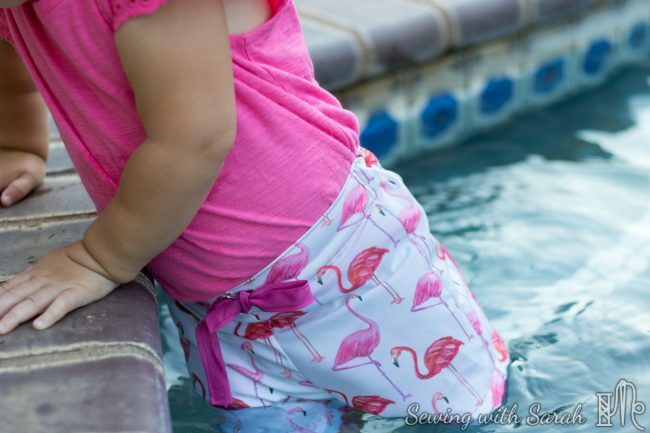 I chose the Long Island Board Shorts by New Horizons Designs, because I loved the piping detail along the back, and the fact that they are designed for both boys and girls (with different cut lines in the pattern for each). 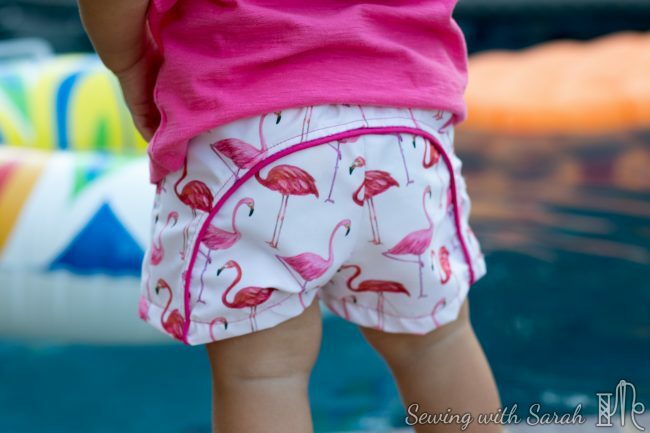 I had originally bought the pattern with my twins in mind, but these flamingos were just begging to be sewn up right away, and the boys were understandably ambivalent about wearing pink flamingo shorts. This is one of the older New Horizons patterns (back when it was called Terra’s Treasures), and as such there are no layers and the pages must be trimmed. The instructions were excellent, however, and made the curved back yoke much easier to sew than I had anticipated. I also like the way the back elastic is sewn to the drawstring, for a flat front and an elasticized back. 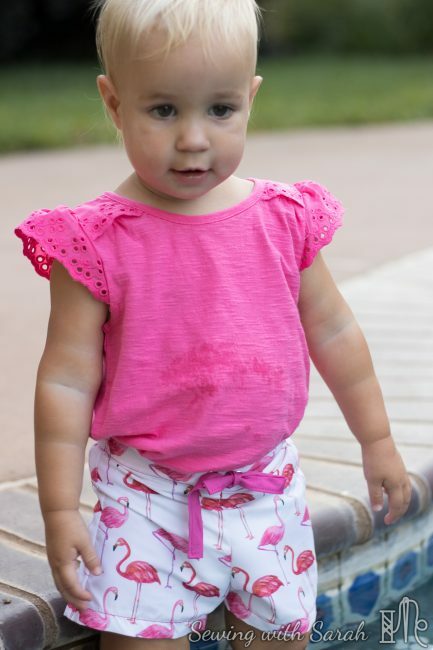 I made the 12-18 month size, and they are a little snug getting over her hips (in a disposable swim diaper), but fit great once on. Depending on her growth, I’m sure I’ll make another pair soon! These only took about an hour to construct from cutting to hem- you can’t beat that! I did use pre-packaged piping and bias tape for the drawstring, because I had a perfect match in my stash! Use a lightweight universal or microtex needle (70/10 or 80/12). Although the material feels thick, the holes made by a bigger needle will really show. Finish your edges. It’s a woven, so you need to serge, pink or zig zag your edges to keep them from fraying. Try not to unpick. The holes made by your needle will be visible and will not disappear if you have to unpick and sew in another spot. Size up if needed. It doesn’t stretch, so you’ll want to make sure you have enough ease to move comfortably. 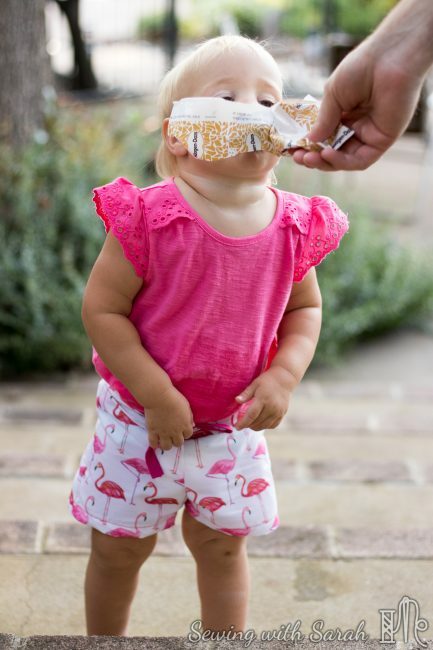 To get her to pose, we had to bribe her with ice cream…which is why her mouth is open in most of the photos! 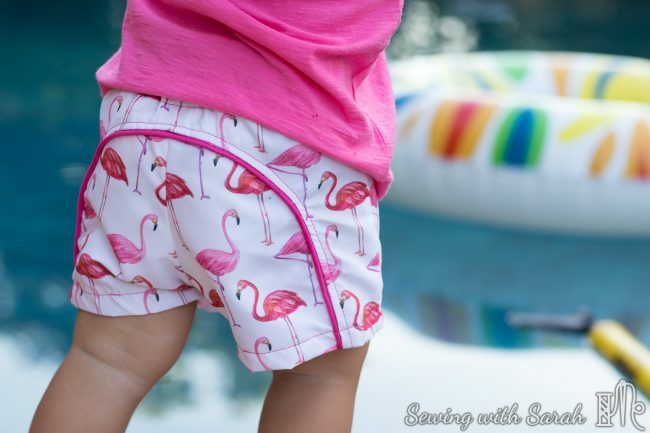 I’m thinking I need a pair of flamingo shorts now….you don’t think I’m too old for flamingos do you? Let’s stay connected! Like me on Facebook, or follow me on Instagram! Note: This post contains affiliate links. If you choose to purchase a pattern from these links a small portion gets recycled into my fabric/patterns budget so I can keep sharing with you! Thank you! Thank you! 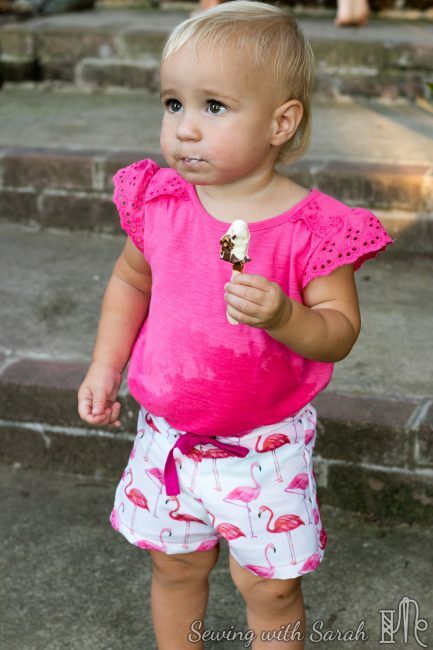 She knows it too….we’re in trouble!